I think you should keep the nature theme of the original set, though I think a tree might be too distracting and hide the Silhouette of the Borealopelta. Perhaps an arid rocky base instead? Something simple without too much popping out of the ground. Also, dude, how much will this cost for Europeans? I just want to run my fingers on that scale detail. 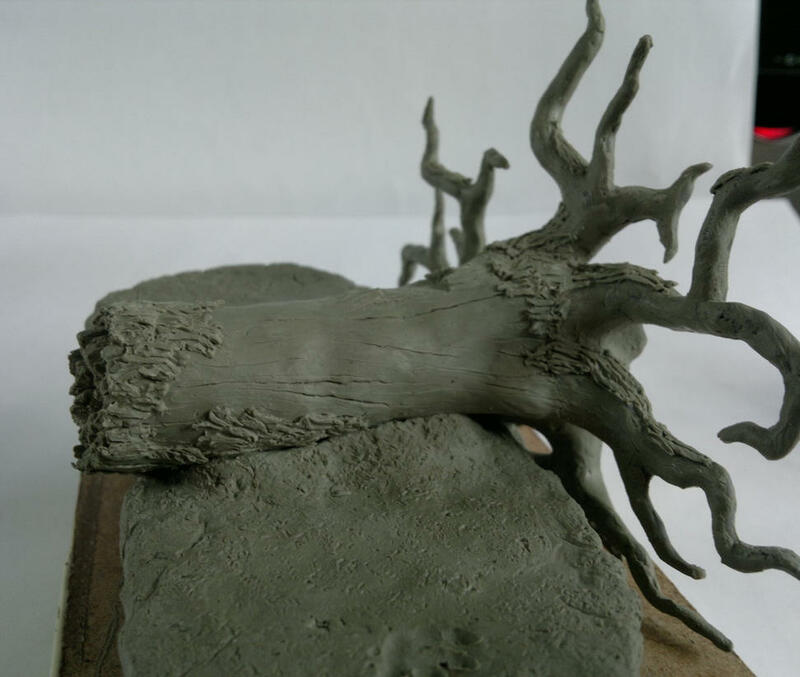 I favor the fallen tree, though I am aware that molding/casting is much more work there and it probably would increase the price (and I'd really like to get this one ). 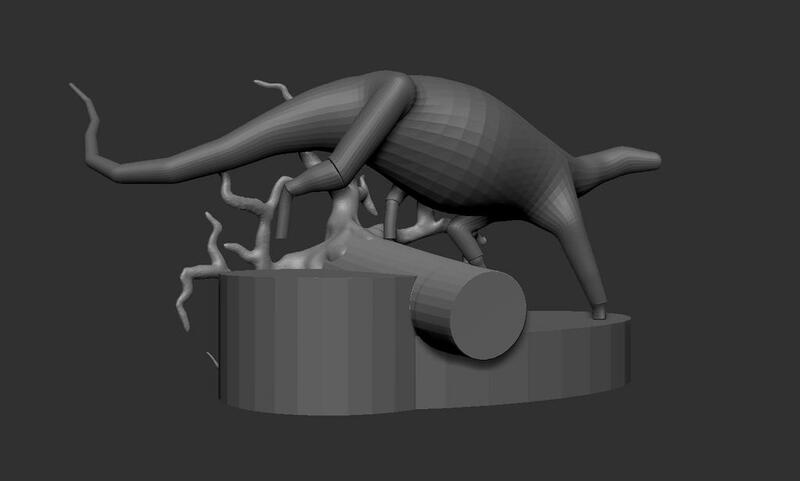 I think, (default) bases for most figures are comparably plain two dimensional and not very attractive, the fallen tree's roots would add a very nice 3D touch and also would fit much more to the environment of the critter as I would see it. Also, the tree trunk would offer the opportunity to give it a specific texture of a prehistoric plant, rocks are just rocks, they look the same today as they did 200 million years ago. PS: Thanks for the reply on the material used, that sounds just as I would like it. Wow, impressive! You must be very patient to be able to do so much details! Thanks for your suggestions! By nature theme you mean the one with the tree, don´t you? 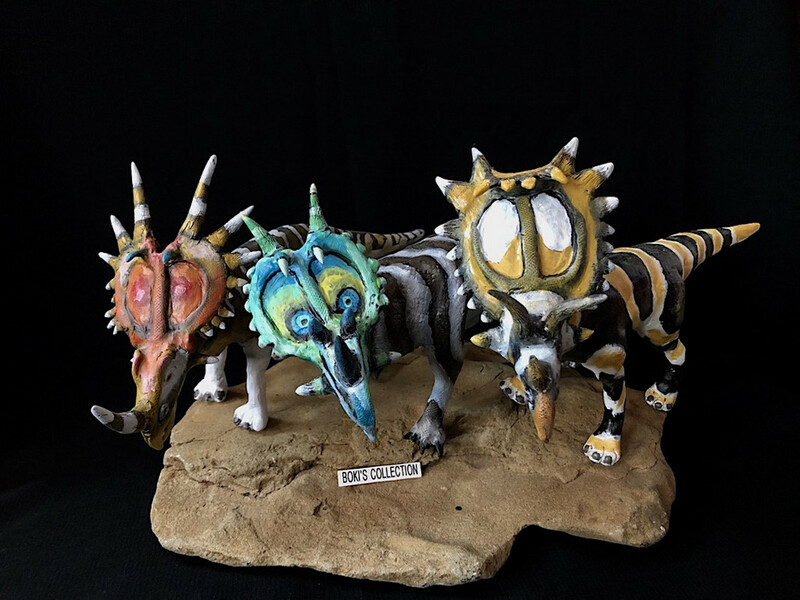 I personally would like to avoid a rocky arid base, because it´s pretty much standard, you see it probably in every second model or figurine. Which is not necessarily a bad thing! They can look quite nice, too. And they are easy to make and fast to sculpt. So it would definitely keep the costs down. Speaking of which, I can´t say much about the final costs right now. I have to factor in the material costs for molding and casting. But I aim to get it somewhere in the range of 100-150€ for the kit. I think that would be an appropriate price range for a kit at this scale and detail, compared with similar kits on the market. I will also offer painted versions this time! Thanks for your input! You have a good point there, rocky bases tend to look a bit generic and are quite common. I would probably make the fallen tree some kind of conifer, since it has a flat root system. Also the flat root system would be easier to mold. But you are right, the costs would be a bit higher! A simple base can definitely be molded as a whole, while the base with the fallen tree would have to be split into, at least 3 parts, I think. I'm a bit late here as was busy yesterday. I think the fallen tree is a much more striking and exciting base. It would make it stand out. I'm glad you abandoned the upright tree. Tall trees are a problem for display cabinets, as you need much wider shelves than the model itself requires. Wider shelves mean fewer shelves in the space available! Don´t worry and many thanks for your input! The fallen tree does add a little bit of extra width to the whole model! But in response to you suggestion, I bend the roots, which sprawled outwards the most, a bit inward again to make the bounding box of the whole model a few centimeters narrower in depth. In terms of design, I think, it still looks good, but it´ll safe a bit more space now! I just want to give you a quick update on the base! First of all thank you very much for all the feedback, that was very helpful! It should be no surprise that I settled for the version with the fallen tree, since most of you wanted to see that one . But I made some changes! First I mirrored the tree, so the roots are on the left side of the dinosaur now. Contrary to what I said before, I think it does look better after all! I think the right flank of the Borealopelta looks more interesting, than the left one, ´cause the legs are sprawled out in gait and the belly with all the detail of scales and osteoderms is much better visible. Also the head is inclined a little bit to the right, which implies that it is about to move to that direction. If the roots where on the right, I think the movement of the animal wouldn´t make any sense. I separated the base-structure, the tree and the root-system and made those three parts ready for printing. The base alone will take about 10h to print . Let´s hope it won´t fail somewhere half trough! That all strikes me as sound reasoning. This promises to be a very visually interesting piece! 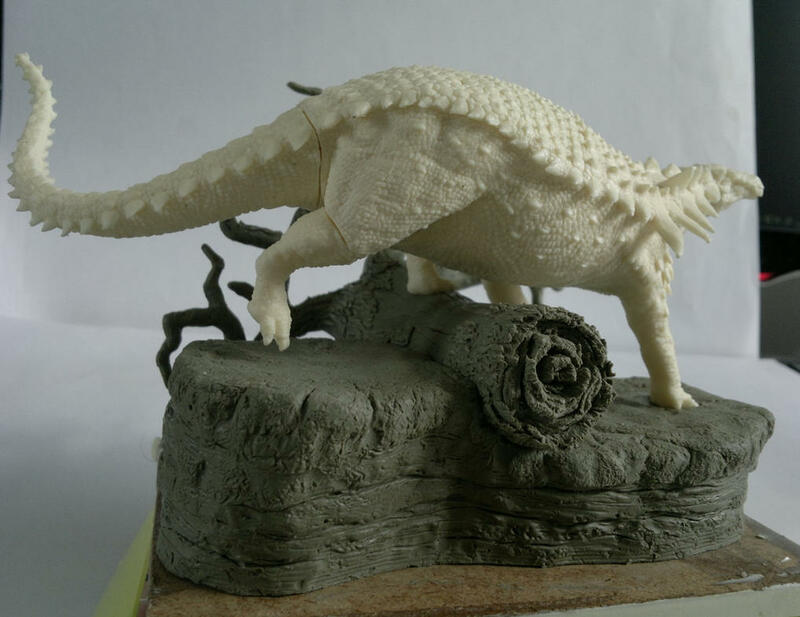 I will soon continue with my 1:60 dinosaur models. And since I got a few suggestions in that direction, I decided to take on the Morrison Formation this time. Started with some sketches and graphite renderings of how I would reconstruct Diplodocus carnegii. I usually don´t make drawings before I start sculpting, but I think it´s a nice way to share my ideas and also hone my drawing skills a bit. I decided to give the Diplodocus some sort of cartilage structure that supports the nose internally. I think that was quite likely the case and pretty much all of the resources about Sauropods, I consulted, suggested this as well. Although my reconstruction probably still is quite conservative. The drawing of the skull shows the speculative cartilage structure which I only made up to help me find the silhouette of the animal. I find it very likely that at least some Sauropods, especially Diplodocids, were able to rear up on their hind legs, since their center of gravity was located at their hips. Also it would have extended their feeding range a great deal. I imagine that they used the big claw on their hands to get additional support by "gripping" on the trunks of the trees they were feeding on. Of course that is pure speculation. But some papers suggest that this claw indeed had some degree of mobility. - Bonnan, M.F. 2005. Pes anatomy in sauropod dinosaurs: implications for functional morphology, evolution, and phylogeny; pp. 346-380 in K. Carpenter and V. Tidwell (eds. ), Thunder-Lizards: The Sauropodomorph Dinosaurs. Bloomington, IN: Indiana University Press. Borealopelta update: the base and tree trunk are printed so far and I will definitely keep the overall design. but the base itself seems a bit clunky, now that I can hold it in my hands. So, I think, I will make it a bit smaller and narrower especially at the foundation (sorry no picture so far). It´s been a while since the last update. I had a couple of other things to take care of over the last few weeks, so I didn´t have much time to spend on this one unfortunately. But I managed to get a couple of things done nonetheless. First of all I did the molds for the model itself. I took a different approach this time. Instead of making a multi-part mold by dividing the model with clay, I just parted the model and mounted the parts on a wooden plate. Then I located the areas of the model where most likely air will be trapped and used thin clay-strings and toothpicks to make air-vents for the specific areas (For example along the most lateral line of osteoderms). After that I built the mold-box around the model and just poured the silicone in. So when it was cured, I basically had a big block of silicone with the model in it. The tricky part was to cut the block open to free the model and get the final mold. I had to be extremely careful where to cut! I tried to cut along the air-vents as best as I could. But it looked extremely messy and I was almost sure to ruin the mold. Fortunately the first casting proved otherwise! The parts came out perfectly fine. I found this strategy to be a big time saver, because I could pour the whole mold in one step. Then I´m also almost finished with the base. The initial 3d prints I did, were way to big and clunky for the model (there must have been something wrong with the scaling in zbrush). 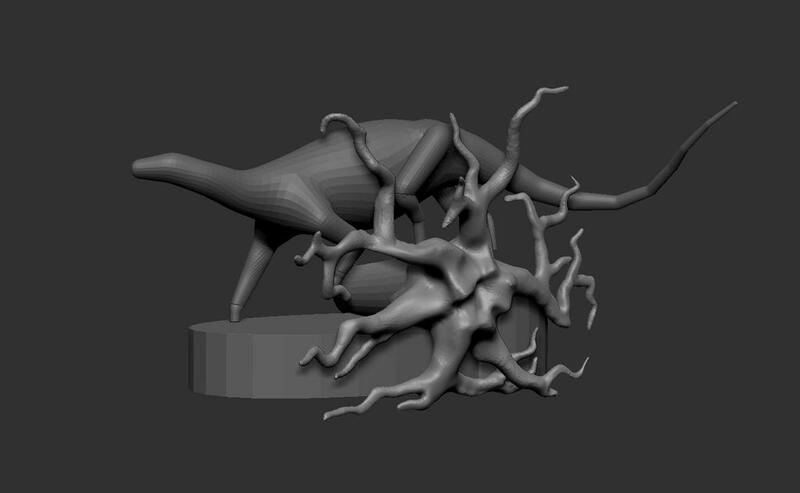 So I ended up only using the print of the roots for the final sculpt. 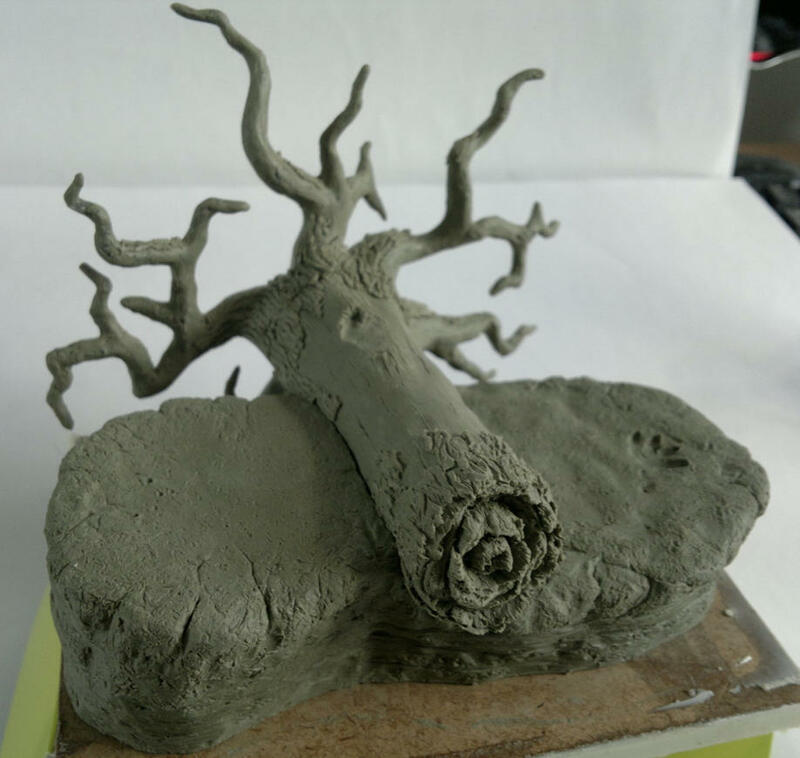 The rest of the base (main structure and tree trunk) are sculpted without an internal structure. Though the main part of the base is hollowed out to save material, otherwise the final casting would be a hefty chunk of plastic. The only thing left to do now, is molding the parts for the base. I´m also thinking about adding a small laser engraved acrylic plate with the name of the animal and some other information. I think that might be a nice addition to the model. That sounds like a clever molding approach. I don't suppose you have any photos of the process? Unfortunately I don´t! But I´ll make sure to take some pictures, when I mold the base parts. I think I´ll use the same technique here! Hi guys! As you may have seen in my other thread, I just released the Borealopelta model. I just wanted to thank you guys here as well for all the input and suggestions you gave me along the way of making this model. I consider this model your achievement as well! So for everyone who has posted under this (Lone Trike Art) Thread so far and thus helped me with creating this model. If any of you are actually interested in purchasing it, please write me a message before you place your order, because I would like to make a special "Thank you"-offer for you! Apart from this, I also made a little mold-making tutorial at my DeviantArt page, if some of you may be interested! @Lone Trike Is there any update on this Diplodocus Concept? Like, will it be a model kit some time? @Takama The sculpture is in the making, though the pose will be different to the one shown in my drawings. I´ll post some pictures as soon as I have the prototype ready. And yes, I´m planning to turn it into a model kit.